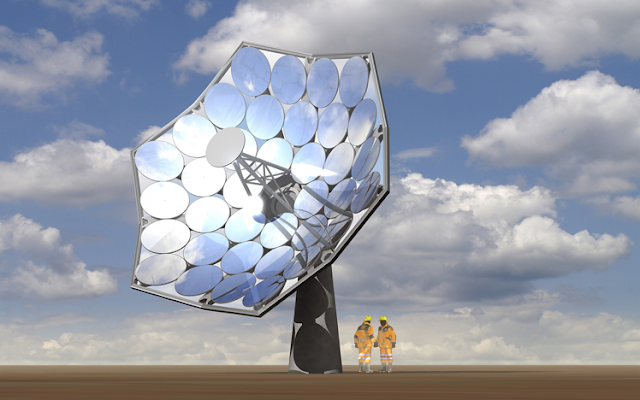 The Solar Sunflower, a Swiss invention developed by Airlight Energy, Dsolar (a subsidiary of Airlight), and IBM Research in Zurich, uses something called HCPVT to generate electricity and hot water from solar power. HCPVT is a clumsy acronym that stands for “highly efficient concentrated photovoltaic/thermal”. This system is 10 meters high with a 40 square meter parabolic dish, made from patented fiber-based concrete. Airlight/Dsolar is behind the Sunflower's reflectors and superstructure, and the photovoltaics are provided by IBM. The two constituent technologies of the Solar Sunflower—concentrated solar thermal power and photovoltaic solar power—are both very well-known and understood at this point, and not at all exciting. What's special about the Sunflower, however, is that it combines both of the technologies together in a novel fashion to attain much higher total efficiency. “With the HCPVT we are ushering in a new generation of solar energy technology. Not only is the system affordable, but it will create jobs where it is installed since many of the materials will be sourced locally. We expect to partner with firms around the world to bring a commercial version to market by 2017” said by Dr. Gianluca Ambrosetti, Head of Research, Airlight Energy. The system can concentrate the sun’s radiation 2,000 times and convert 80 percent of it into useful energy to generate 12 kilowatts of electrical power and 20 kilowatts of heat on a sunny day — enough to power several average homes. The solar panels are designed by IBM and are equipped with microchannels that use water to carry excess heat away. This cooling process boosts the panels’ efficiency and increases the solar-to-electricity conversion rate. The reflectors’ concave shape is sealed by a light vacuum that can be released if the cooling system fails, preventing damage to the cells from overheating. The inside of the parabolic dish is covered with 36 elliptic mirrors made of 0.2-millimeter-thin recyclable plastic foil with a silver coating, slightly thicker than the wrapper chocolate bars are packaged in, which are then curved using a slight vacuum. The mirrored surface area concentrates the sun’s radiation by reflecting it onto several microchannel liquid-cooled receivers, each of which is populated with a dense array of multi-junction photovoltaic chips—each 1×1-cm2 chip produces an electrical power of up to 57 watts on a typical sunny day. The mirrors and the receiver are encased with a large inflated transparent plastic enclosure to protect them from rain or dust. The enclosure also prevents birds and other animals from getting in harm's way. Explore further about this Innovative technology by clicking IBM.